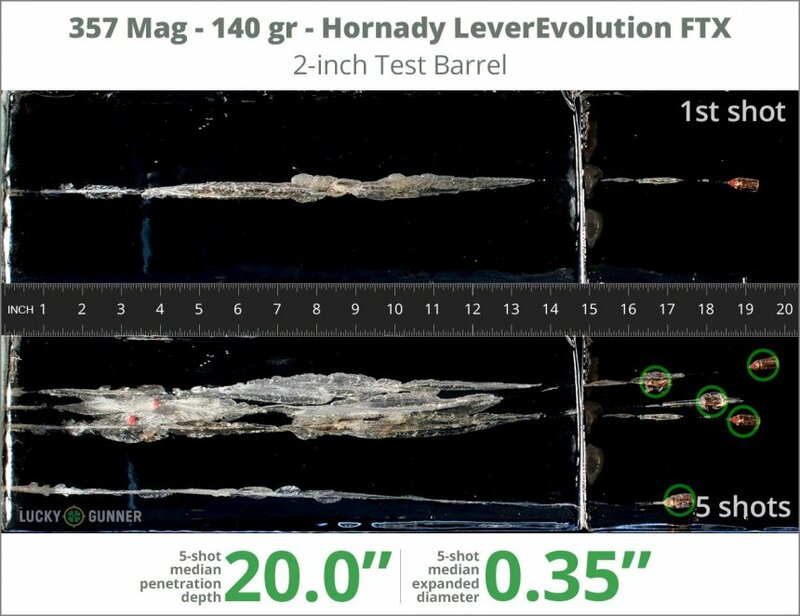 We test fired five rounds of .357 Magnum Hornady 140 gr LeverEvolution FTX into synthetic ballistic gelatin to observe its expansion and penetration characteristics. The ammo was fired from a Kimber K6s pistol at a distance of 10 feet. A four-layer barrier of heavy fabric was placed in front of the gelatin to simulate clothing. The complete data for this load from our test can be found on the chart below. The photo slider displays the expanded bullets that were retrieved from the gel. Pictured below is a high speed video that shows the bullet entering the gel at approximately 10,000 frames per second. 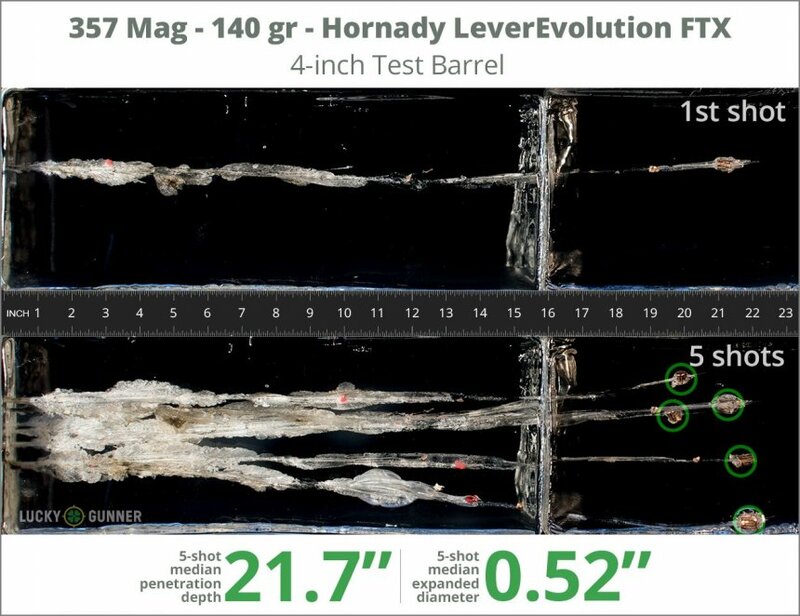 The diagrams at the bottom of the page should give you an idea of how this load compares to other .357 Magnum loads. 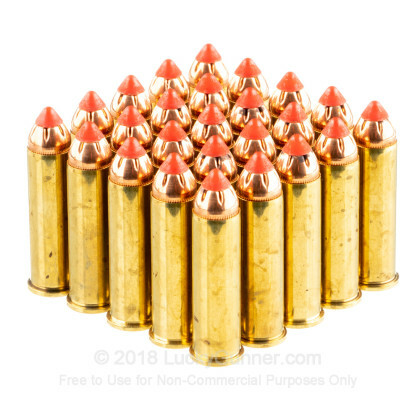 0.75" This ammo: 0.35" Min: 0.35" Median: 0.55" Max: 0.75"
20" 0" 9.2" 17.3" 41.7" This ammo: 20" Min: 9.2" Median: 17.3" Max: 41.7"
We test fired five rounds of .357 Magnum Hornady 140 gr LeverEvolution FTX into synthetic ballistic gelatin to observe its expansion and penetration characteristics. The ammo was fired from a Ruger GP100 pistol at a distance of 10 feet. A four-layer barrier of heavy fabric was placed in front of the gelatin to simulate clothing. 21.7" 0" 9.2" 17.3" 41.7" This ammo: 21.7" Min: 9.2" Median: 17.3" Max: 41.7"
I ran these rounds through my lever action rifle and they were flawless and accurate. I use this round in my Ruger 357/77 bolt action rifle. The poly-tip ensures that the rounds feed smoothly from the magazine, which is definitely an issue with that rifle. 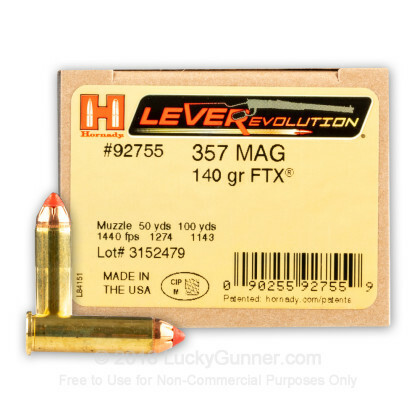 The .357 Hornady LeverEvolution has a bit more recoil than the standard .357 handgun rounds I have shot out of the rifle, so I suspect that the advertised increased muzzle velocity / energy for this round is true. 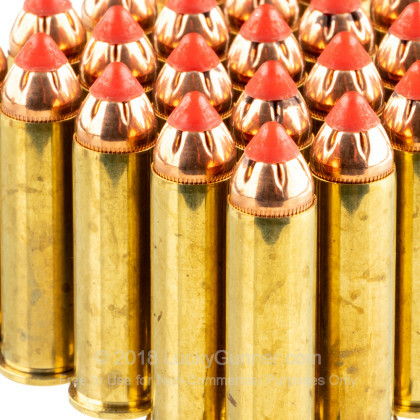 It is an expensive round, but worth it if you want a specialized load for your .357 carbine. 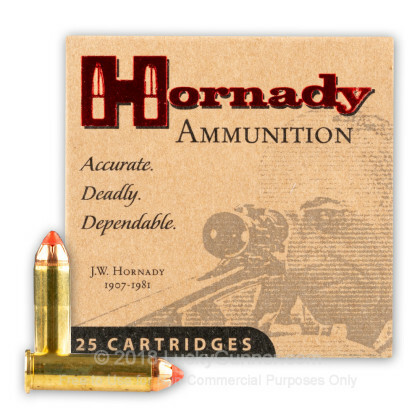 357 Magnum - 140 gr JHP FTX LEVERevolution - Hornady- 25 Rounds: We are issued Hornady at work and depend on the quality and performance of their products. 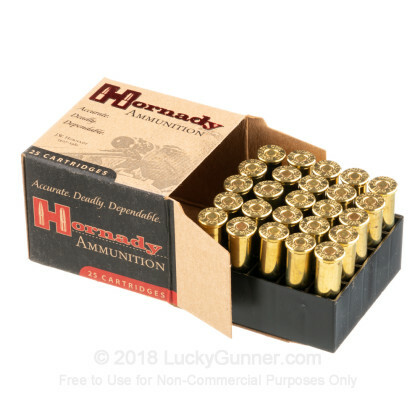 I bought and use this for my S&W 686 357- no issues thus far with about 100 rounds of this stuff fired with several hundred rounds of similiar Remington ammo. Will buy more. 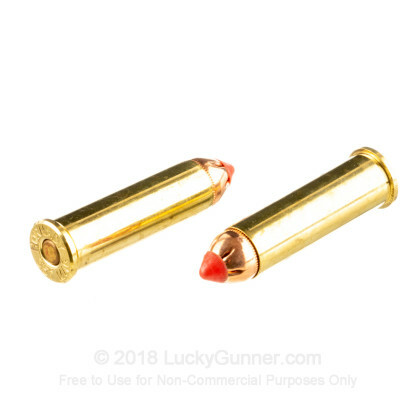 Lucky Gunner prices are very competitive and their service fast/reliable.